This set of Basic Biochemistry Questions and Answers focuses on “The Composition and Architecture of Membranes”. 1. Which of the following acts as a passive electrical insulator? Explanation: Myelin sheath acts as a passive electrical insulator. 2. Which of the following membranes contain low cholesterol and high cardiolipin? Explanation: Inner mitochondrial membrane contains low cholesterol and high cardiolipin. Plasma membrane has high cholesterol and low cardiolipin. 3. Which of the following is important in signal transduction triggered by hormones? Explanation: Phosphatidylinositol and its derivatives are important in signal transduction triggered by hormones. 4. Which of the following are the major component of chloroplast membrane of plants and are absent from animal cells? Explanation: Glycolipids are the major component of chloroplast membrane of plants and are absent from animal cells. 5. How many types of lipid aggregates are formed when amphipathic lipids are mixed with water? Explanation: Micelle, bilayer and liposome are the 3 types of lipid aggregates are formed when amphipathic lipids are mixed with water. 6. Which of the following types of lipid aggregates has the maximum stability? Explanation: Bilayer is relatively unstable and spontaneously forms a third type of aggregate, folds back on itself to form a hollow sphere, liposome that has maximum stability in their aqueous environment. 7. When cross sectional area of the head group and acyl side chain is similar, which of the following lipid aggregates formation is favored? Explanation: Bilayer formation is favored when cross sectional area of the head group and acyl side chain is similar. 8. When cross sectional area of the head group is greater than that of the acyl side chain, which of the following lipid aggregates formation is favored? Explanation: Micelles formation is favored when cross sectional area of the head group is greater than that of the acyl side chain. 9. Which of the following is a choline containing lipid? Explanation: Phosphatidylcholine and sphingomyelin present in the outer leaflet are the choline containing lipids. Explanation: Only when phosphatidylserine in the plasma membrane moves into the outer leaflet is a platelet able to play its role in the formation of blood clot. 11. Which of the following glycerophospholipids is not common in inner leaflet (cytoplasmic)? Explanation: Phosphatidylcholine is common in outer leaflet. 12. Which of the following has high lipid content? Explanation: Myelin sheath relatively contains high lipid content. Explanation: Plasma membrane is impermeable to ATP, glucose and K+. 14. How are the intrinsic proteins in cell membrane distributed? Explanation: Intrinsic proteins in cell membrane are distributed symmetrically. 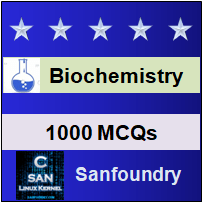 To practice basic questions and answers on all areas of Biochemistry, here is complete set of 1000+ Multiple Choice Questions and Answers.